KIEV, Ukraine -- Two years after a pro-Western revolution provoked a conflict with Russian-backed separatists, Ukraine faces a graver threat from rampant corruption — the problem that sparked its 2014 revolt in the first place. 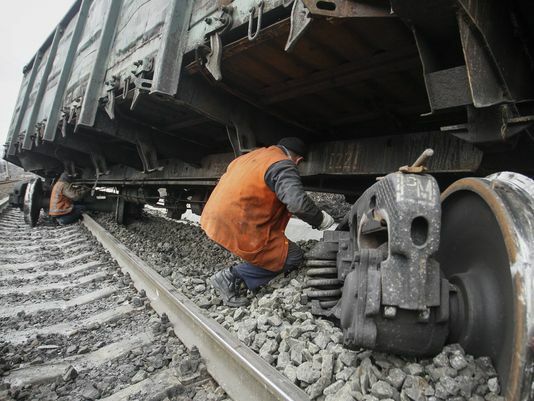 Railway workers examine a damaged wagon after an explosion in Yasinovataya town, Donetsk region, Ukraine, on Feb. 17, 2016. In eastern Ukraine, government forces are under the fiercest assault from militants since a cease-fire began to take hold in the beginning of September. And in the capital, Kiev, Ukrainian politicians face a growing backlash over an economy in shambles and widespread cronyism it had pledged to eradicate when parliament voted on Feb. 22, 2014, to oust Russian-backed President Viktor Yanukovych. Parliament's actions were backed by mass demonstrations on Maidan square in Kiev, where Yanukovych's troops shot and killed many protesters. While the conflict in the east saps energy and costs lives, what’s at stake in Ukraine’s faltering struggle with corruption is the support of its European allies and full integration with the West, Germany's ambassador to the United States, Peter Wittig, warned. The “fight against corruption should be a top priority of the Ukrainian leadership,” Wittig told USA TODAY. International monitors reported hundreds of mortars, artillery and rocket attacks this past Thursday that were launched from territory backed by Russian-backed militants against national forces. According to Viktor Muzhenko , Ukraine's Chief of the General Staff, active Russian servicemen represent a fifth of the 35,000 fighters in the separatist strongholds of Donetsk and Luhansk. Russia continues to supply arms, ammunition, fuel and money almost daily, Ukraine’s Main Intelligence Directorate of the ministry of defense told USA TODAY. Ukrainian officials also accuse Russia of launching powerful cyberattacks, such as one that temporarily forced a power plant to close in December, and an attack on the Kiev airport that was intercepted in January by Ukrainian cyber security analysts. Russian President Vladimir Putin, whose government had long denied any military role in eastern Ukraine, admitted in December that his military was conducting "certain tasks" there. The Russian military did not respond to USA TODAY requests for comment for this article. Amid the ongoing attacks, Ukrainian leaders have implemented some needed economic and political changes, but not enough to satisfy their European donors and reformists at home. Ukraine created a new, more professional national police force, it closed banks that were involved in money laundering and cut subsidies for gas and electric service, causing prices to rise four-fold, said Anders Aslund, an economics analyst at the Atlantic Council think tank. An electronic state procurement program saved 2% of economic output by reducing corruption and increasing competition for government purchases. Reductions in regulations and a free-floating currency resulted in minimizing Ukraine’s debt service for the next four years, Aslund said. But the accomplishments were too few and too slow to satisfy reform-minded Ukrainian activists, hundreds of whom returned to the streets of Kiev this past week and again Sunday to push parliament to do more. The backlash resulted in the resignation of Prosecutor General Victor Shokin, as demanded by Ukrainian President Petro Poroshenko, U.S. Vice President Biden and activists who said the country’s top law enforcement officer had failed to crack down on cronyism and corruption. Parliament also passed a law privatizing state-owned enterprises, which have been used to favor political supporters. But lawmakers have not yet created full transparency in government spending, which has been resisted by the country's wealthiest entrepreneurs, who benefit most from that business. Prime Minister Arseniy Yatsenyuk survived a vote of confidence last week after a raft of lawmakers backed by those oligarchs walked out without voting. Aslund said the political shenanigans put at risk $4 billion in financial assistance from the International Monetary Fund, the European Union and the United States, funds Ukraine needs to remain on a solid financial footing. Lenders will not disburse the funds if Ukraine is about to get a new government whose commitment to the IMF program is uncertain, he said. Michael McFaul, a former U.S. ambassador to Ukraine, said the next year will be pivotal if Ukraine’s leadership is to avoid another revolt. “I don’t think there’ll be tolerance for more muddling” by Ukrainian politicians, McFaul said. “Ukrainians believe they’re in a fight for their lives."